Are you looking to introduce a new dessert to your usual apple and pumpkin pies this year? 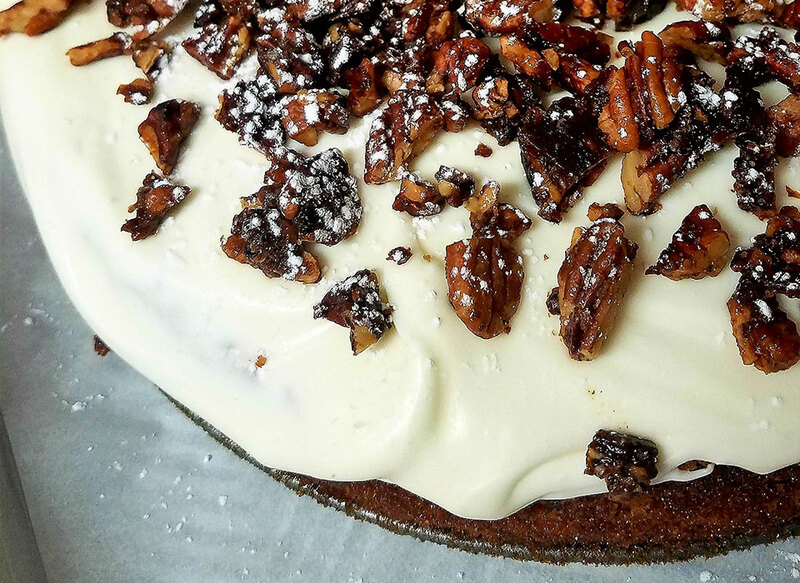 This carrot cake will be a showstopper at your Thanksgiving celebration! It’s chewy and moist and the ginger, nutmeg and cinnamon satisfy all your fall flavor cravings! This recipe translates perfectly between cupcakes, Bundt pans or any baking pan size so you can have fun with the way you present it. This is a favorite among our guests at the lodge and we are excited to pass it on to you and your family. Enjoy, and Happy Thanksgiving. In a separate bowl combine the flour, baking powder, baking soda, salt, cinnamon, nutmeg and ginger. Whisk to combine, then slowly add the dry mix to the wet. Slowly pour in milk and mix. Use a spatula to scrape the sides and allow the mixture to fully come together. This may mean leaving the mixer on for a couple minutes at medium speed. The mix should be semi-thick with a creamy texture and no lumps. Prepare a pan with a good baking spray or grease and flour. Pour batter into pan and Bake at 350° degrees for 45-55 minutes or until a toothpick comes out clean. If making cupcakes, cut the time in half and check with a toothpick. Allow cake to cool for 15-20 minutes before turning it out onto a cooling rack and be sure to wait until it’s completely cool before adding the glaze. Milk – 1 tbsp. at a time if needed. Add powdered sugar and vanilla. Add in 1 tablespoon of milk at a time until the icing is as thick as you’d like it. If there are lumps, continue beating on high until they are gone and the mixture is smooth. Be sure cake is completely cooled before putting the icing on the cake. Heat over medium for 3-5 minutes, stirring frequently so the walnuts do not burn. Spread them out on parchment or a plate to cool and crumble over the cake and glaze right before serving. Dust with powdered sugar if desired. Enjoy!